Elise M. Boulding (1920 –2010) was a sociologist and author as well as a peace and women’s rights activist. She received numerous awards for her lifelong commitment and contributions to peace and justice. She believed the family unit, and especially the role of women within that unit, was crucial to the global peace movement. When World War II broke out, Boulding became involved in anti-war activities and joined the Religious Society of Friends, making a life-long commitment to the Quaker community. She and her husband, Kenneth Boulding, raised five children. Throughout her years of teaching and research in the field of sociology, she was able to fulfill her roles as mother and wife. Her experience as a mother and homemaker, she often said, informed her work. Her writings on the foundations of peace would reflect her valuation of women, children, and family in the peace process. Boulding received a BA in English in 1940 from the New Jersey College for Women (now Douglass College at Rutgers), a Masters Degree in Sociology from Iowa State College in 1949, and a Ph.D. in Sociology at the University of Michigan in 1967. She and her husband were invited to become Scholars in Residence at Dartmouth College. While at Dartmouth, she chaired the Sociology Department and developed the nation’s first Peace Studies program. She is credited with greatly advancing the academic study of peace. Boulding’s non-academic accomplishments range from her position as international chairperson (1967-70) of the Women’s International League for Peace and Freedom (WILPF) to her many years of developing the International Peace Research Association (IPRA), which she served as Secretary General (1989-91) to her work with the Consortium on Peace Research, Education and Development (COPRED) and with UNESCO. She also served on the board of the Japan-based United Nations University (1980-86). 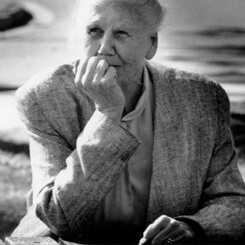 Elise Boulding was the author of numerous books, including The Underside of History: A View of Women through Time (1976); Children’s Rights and the Wheel of Life (1979); Building a Global Civic Culture: Education for an Interdependent World (1988); and Cultures of Peace: The Hidden Side of History (2000).